A brilliant story, and the system which the murderer uses in amazing, the story itself is good then too, and the plot isn't what you think it is. A cool story, with a second story in it, a piece of Mouri and Ran's past, I gained alot of respect for Mouri through this (and the first) movie. I see this character in a (almost) new light. Same ol' characters, just as usual good, we get a look at a piece of Mouri's and Ran past, which made me see Mouri in a new light, a better light, the new introduced characters, the old villian, the victims and the murderer are great, all are different, yet the same in a way, and without knowing it (most of them) bear a relationship with each other. Magnificent! It all begins with Ran having a nightmare, where her father shoots her mother. This actually happened, he only grazed her. Now, 10 years later, Ran tries to find out, why did he shoot the kidnapper, if he knows, he could've killed his own wife? This is the sidestory for this movie. The real story is how a murderer takes out (or tries to take out) 13 people which are related to Det.Mouri, by playing a smart death-system via cards and numbers. As soon as injuries become murders, our... police team, Mouri and Conan get angered and try to find out who the murderer is, and why he's doing it. It all folds together in the end, with most of the (chosen) victims in one place, this is where the mainplot folds out. At the ending of the movie itself, the reasoning from the past (where Mouri shot his wife) comes to place, when it's happening again, (this time of course with Ran and Conan). The art's good, so is the animation, sometimes the animation is really smooth and lovely, sometimes it's just normal animation. But they did a good job. Continuing with our look at the non-canon yet still absurdly popular Detective Conan movies, we have the second one: The Fourteenth Target. Since this is the second movie, don’t expect me to be as soft as I was to the previous movie. This movie better do something more original and or risky or I’ll riot. Sadly an issue this movie has right off the bat is that, in some ways, it’s a bit of a repeat of the first movie. Like, last movie was a series of bombings that had a pattern, and this movie is a series of murders with a pattern. Of course there are some differences, namely that the heroes find out about said pattern very early on, so the cast is moreso trying to prevent the murders while following the pattern. This movie also introduced one of the most (in)famous memes in the franchise: Hawaii! Yup, every time Shinichi does something crazy, he’ll just hand wave it as him having learnt it in Hawaii by his father. In this movie, it turns out two of the things Yusaku apparently taught him was to use a gun and FLY A HELICOPTER! Like, I can see why he’d like to teach him the former, but what’s the point of even teaching him the latter!? Another issue with this movie is that it’s final twist of who the culprit is ends up being predictable. Of course it is not gonna be the guy everyone suspects it is, we know that it’s actually gonna be one of the possible victims instead, so what’s even the point? Also, the actual culprit is voiced by Nakao Ryusei, the voice of Freeza. Because of course that would be the case. Actually, on that note, that’s one of the amusing bits about most of the movies, most of the one off characters will often have some big name actors attached to them. I already mentioned Nakao, but there’s also the late great Suzuoki Hirotaka, Okamoto Maya and the late great Utsumi Kenji. That said, there are some things that put this above the first movie, even if it technically does more things wrong. For instance, the whole scene in which the cast is stuck in an underwater complex is great, with the feeling of paranoia running through. I also feel this movie does much more service to Kogoro’s character than most of the anime fillers do. The thing about Kogoro is that he walks a very thin line between incompetence and laziness. The manga original stories moreso goes for the latter, as while he’s a good detective (Not as good as, say, Heiji or maybe even Yusaku but still competent) he’s just too lazy to follow more than one line of reasoning. The anime by contrast moreso goes for the latter, being legitimately bad at his job and only gets as far as he goes because Shinichi knocks him out. Here we get a happy balance, being shown as a bit lazy at times, but is still a competent detective in his own right. The movie is also the only Detective Conan related… thing that actually bothers to give an explanation as for why he and Eri are estranged. Oh yeah, this is also Eri’s movie debut! Then there’s the climax. If you thought the last movie’s climax of the last movie was intense, well, this movie has the cast escaping an exploding underwater complex, then a hostage situation at the top of a collapsing building and THEN trying to get the now injured hostage into a helicopter. Yeah, I think we know which movie has the better climax. So like the last movie, I really enjoyed this one. It had more issues, sure, but I feel that it also does a lot more right than the last one. Definitely another movie that’s easy to recommend. thankfully there is more character on this one. frankly its way too eazy to guess the culprit in the first because of how there is only a few character in there, the second have more character and more diverse personalities oh and the character from tv series is coming back. 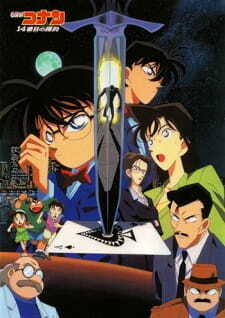 After the success of The Time-Bombed Skyscraper, the movie staff made plans to make the next movie bigger and better by having it center on serial attacks on the people close to Mouri Kogoro. Figuring out who's going to be the next target is very fun. Not only that, but aspects from Kogoro's past come to light that forces Ran to question her father's character(although, people may find the truth behind it easy to figure out). All of these things make The Fourteenth Target such a treat to watch. That said, I feel like a lot of the choices the main characters make are pretty dumb(e.g. was it really a good idea to use an elevator in a building that's falling apart?!). A lot of trouble could've easily been avoided if they were just a little smarter(which they're supposed to be). While the first half was very fun, people might get a little bored in the second half with very little action taking place. Despite these gripes, I still had a very good time watching The Fourteenth Target and would definitely say it is a very fun Detective Conan movie.